Last weekend we took a spur of the moment mini vacation! We packed up our tiny human and hit the road for a spooky adventure to Salem, MA! We stayed at the Lakeside Inn in Wakefield, a 20 minute drive from Salem, it was quiet, super clean, affordable, and wicked baby friendly! Not only were they nice enough to put us in a room at the end of the hall, but they also provided us with a crib so our little one could have his own safe place to sleep! Not having to pack a crib was beautiful and really took a large amount of stress away from packing. One thing I did stress about was if I packed enough of everything, its one thing as an adult to forget a toothbrush or comb, but not having enough bottles or formula coupd have been a nightmare! I do suggest the plus two rule when packing. The rule follows if I thought I had enough I then packed plus two so I was covered in all situations. It was easy though, I set one bag for feeding items and diaper changes, then took our fully stocked diaper bag, and put four outfits and two sets of jammies in our bag. We all traveled in three bags which was efficient but allowed for plenty of extra things. 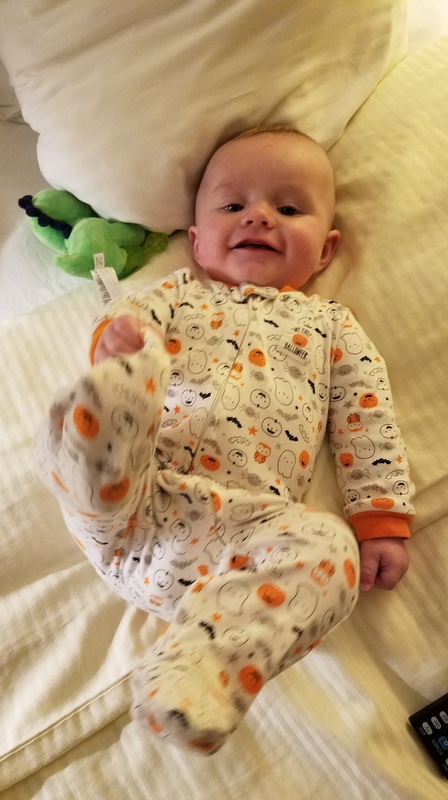 My stress about packing aside, Ezra was super excited to go on vacation and loved laying on the big bed to play with his toes at the end of the day! Once we settled into our hotel, we decided to head into the city! We were lucky enough to find parking amongst the October chaos, and with our stroller and baby carrier in tow we were off. We weaved our way through the crowded streets, stopping to look into a plethora of shops and really just take in the sights of the witch city during peak visiting season. Ezra loved all the different sights of the city and was the perfect tourist as we made our way through the historical district. As it got closer to dinner time we decided to give the Bit Bar a try, my husband being a fan of anything to do with video games as well as burgers, it was a no brainer! 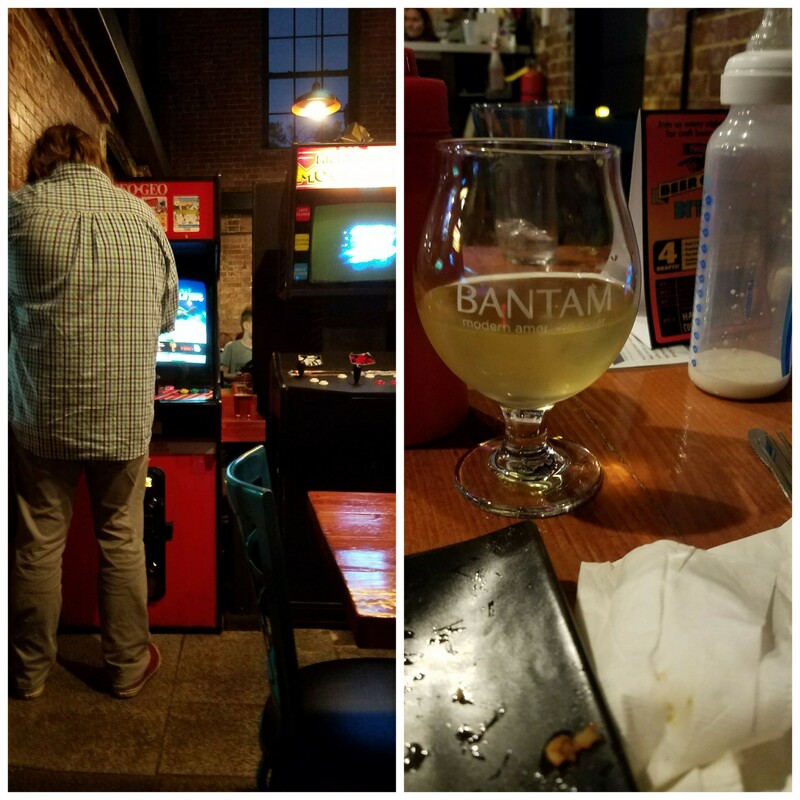 Once seated in what used to be the old Salem jail, we ordered and took in the atmosphere of the basement arcade bar. The food was phenomenal, I chose the black bean burger and was blown away by the freshness! The service was awesome and very accommodating for having an infant and stroller. We made it through dinner and decided it was time to head back and tuck in for the night with some junk food and a Harry Potter marathon, a perfect end to our mini vacation! The next day the weather was cold and dreary so we took our time packing up and headed back home after a great 24 hours away! I’m beyond lucky to have such an awesome little family that is willing to adventure with me, and can’t wait to see where our next trip takes us!